Welcome to Offscreen, an independent print magazine with a thoughtful, human-centred take on technology and the web. Discover purpose-driven people, products, and ideas that shape the future. More about us. 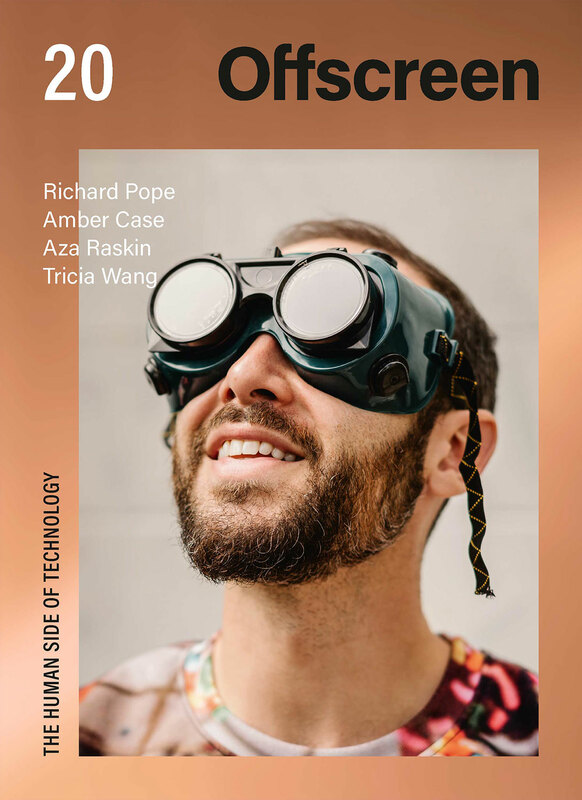 Published three times per year in beautiful print, Offscreen Magazine is a thoughtful deep-dive into the entrepreneurial spirit and future vision of people working with technology. Intimate conversations with entrepreneurs, designers, thinkers, activists, researchers, and more. Food for thought through reflective, personal stories on life and work in a connected world. A showcase of compelling, impactful gear, ideas, and projects to watch. Diverse opinions and insights by technologists from around the world. Peek behind the curtain: we love sharing our process and thoughts on indie publishing through our blog. Buy or subscribe online or grab a copy from one of our 109 global stockists. If you work pushing pixels or conjuring code, Offscreen Magazine will make you feel human again. I can’t get enough of Offscreen. I love every page of every single issue! Inspiring content and impeccable design! Subscribed for the next three issues. Every Offscreen so far has changed the way I’ve wanted to conduct life and business. Keep it up. If you haven’t already, check out (and buy) Offscreen - probably the single most beautiful magazine I’ve ever seen. Inspiring stuff! Great design and great content. Also love the way Offscreen handles advertising with a fair, tasteful non-obtrusive approach. Other magazines should take note. The only thing disappointing about Offscreen is when you realise you’ve finished every article contained inside. It’s the first mag I’ve read every word, cover to cover (including the ads) ever such inspiring people. Just awesome. Offscreen Magazine is a thoughtful dive into the lives of creatives, best enjoyed with a morning coffee. My summary of Offscreen: emanates tranquility, restful for eyes and mind, content drew me in — I felt welcome, like sharing over cup of tea. It’s rare these days to find a magazine that’s so infectious I sneak away from everything just to read another article. Nice! I whole heartily recommend Offscreen. Printed beautifully, lovely design and the content is even better. Offscreen is such a quality publication. It always leaves me feeling smarter and enthused about the world we live in. Every time I read something from Kai reminds me of the deep well of respect I have for what he’s done and will do with Offscreen. Last month I read issue 13 of Offscreen. I forgot how much I enjoyed reading a magazine. Now I remember! Thank you! Really amazing work! I never thought I’d subscribe to a print magazine again in my life. And yet somehow Offscreen gets it so right that I did. Well done! Just received my copy of Offscreen. Even better than anticipated, great work. Haven’t seen a mag of this quality for a long time. Look forward to reading through it all. Excited! Received my first hard copy of Offscreen and not going to sleep until I read the last page. Reading Offscreen feels like applying a first aid kit for the soul. I’m keen to not rush it, to savour each page. These days it takes me more time to read uninterrupted. But it was worth it for this gorgeous and insightful latest issue of Offscreen! Cannot wait to get my hands on the next Offscreen. This is such a masterpiece every time. Thanks a lot Kai for that joy!